In 2011 I covered what was then the largest U.S. air assault in American war history. I photographed the U.S. Marines in battle with my professional DSLR cameras. I also took my personal smartphone with me to the front lines. I saw that the Marines were using their own phone cameras to make pictures of their war. But they were not taking news pictures. They were recording memories, keepsakes, and love notes to send home. With my phone, I tried to make the same kind of pictures that I imagined the Marines were making. I tried to speak their language. Once published, I was criticized for these photographs. Some asked why a professional photographer would use a phone to cover an important global news event. 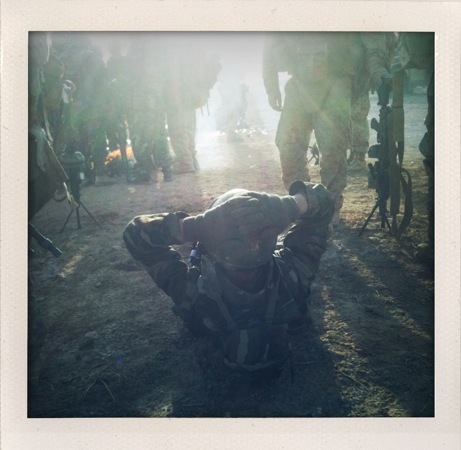 Some even thought by photographing war with a tiny phone I'd shown disrespect for my profession, or for the Marines. 2011 was the year that Instagram was invented and before social media would become integrated into how we work and live. Fast forward to today. Smartphone photography is ubiquitous and Instagram users are counted in the many hundreds of millions.